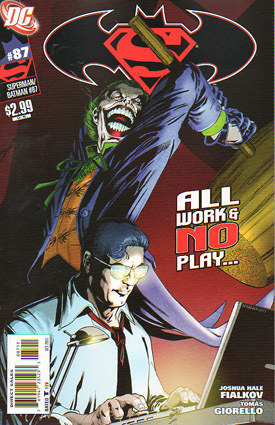 The Joker tries to kill Clark Kent with a giant mallet. (Reviewer's note: This is the most amusing opening line I have ever written in a synopsis. Just wanted everyone to know that.) Clark ducks and rolls and manages to evade the Joker's attacks and even tries to reason with the Clown Prince of Crime but the Joker is insane so that doesn't go too well. Suddenly Batman busts in through the window and pops the Joker on the mouth. The Joker recovers, grabs Clark and dives out the window after releasing a gas bomb. Batman saves Clark with some super powered assistance. After taking care of the Joker Batman informs Clark of Martin Mayne's involvement in Remington's death. Kent and eventually Batman confront Mayne. Mayne doesn't seem to feel too guilty about this even after Clark reveals that Wayne Enterprises just bought the paper and Mayne is now out of a job. Clark informs Mayne that he isn't going to run the story he has been working on because it would be against what the paper and Remington stood for. Later Superman is not comfortable with how things played out. Batman points out that they need to move on adding that Superman is an architect who is building a better future while he is a fireman doing his best to put out the fires and move on to the next one. Batman tells Superman to go build the future meanwhile Batman has work to do. Story - 4: It is really weird to be writing the review for the last issue of SUPERMAN/BATMAN. When this title launched back in 2003 I shared the reviewing duties with a fellow by the name of Michael O'Conner until issue 17 and then I was, as Eric Carmen once sang, all by myself. This is the first book I have been with from darn near beginning to the very end. I have mixed emotions about that. On one hand after Jeph Loeb left the quality of the book and stories became hit and miss with the misses leading by a wide majority. On the other hand it was a (mostly) monthly book where Superman and Batman teamed-up. While I personally believe that such stories work better in smaller doses it was still kind of cool that this generation got its version of the World's Finest. So writing this review makes me a little sad. Closing out a book is not fun. Turning my frown upside down slightly is the fact that this issue was a solid finale to what has become one of my favorite storylines to appear in this series. While I had issues with how the Joker looked (see the Artwork section of this review) I liked how he was written and it was neat to see him interact with Clark Kent, which isn't something that rarely happens that often if at all. I also enjoyed Batman "saving" Clark as a way to get around Clark having to expose his identity. The highlight of that scene was Clark thinking about the fact that he might have to reveal his identity to the world because he was falling to his supposed death. That was a standout moment for the entire story arc and had one of those bits of dialogue (internal or otherwise) that will stick with me for a long time to come. I did have a couple of problems with this issue and the resolution to the storyline in general, which surprised me. The biggest problem was the fact that Clark and Batman let Mayne get away with his involvement in Remington's death. The confrontation itself was great, especially Clark's end of it. I just didn't like the fact that Mayne was involved in a murder and all he loses is his job and possibly his reputation. You could argue that that was punishment enough, but I just don't think Batman and Superman would let it go at that. The other issue I had was the final scene. I liked Batman's (and Fialkov's I guess) take on the roles he and Superman play in the world. Superman is the symbol of hope and would like to build a better world. Batman is very much the firefighter, despite what Dan DiDio has said on several occasions. My problem stems from Batman's final line of dialogue. "Go build the future, Kent. I've got work to do." I found that to be a very arrogant statement. It feels to me that Batman is diminishing Superman's place in the world. "You go be the symbol of a better world, Clark. I have REAL work to do." I could be misreading this or misrepresenting what Fialkov was going for but that's how it read to me. Other than that this was a fantastic story. I get the feeling that if there were more stories like this in SUPERMAN/BATMAN the title might have gone into the DCnU. And now I say goodbye to this title. We've had some good times, SUPERMAN/BATMAN. You started out on a strong note and you finished on one. In between there was laughter and there was frustration and you even made me cry once. Even though I didn't always like you I will still miss you. Maybe we can get together again someday. Weirder things have happened. Art - 4: Overall I liked the artwork in this issue. The storytelling was clear and the style was pretty crisp. Batman looked good. Clark Kent looked good (especially the shot of Clark pointing the finger at Mayne) and I liked Giroello's take on Superman. There was just one problem. I really didn't like Giorello's take on the Joker. It was the way he did the Clown Prince of Crime's eyes, really. It just doesn't look good. I am not going to harp on it but I am not a fan. Other than that I dug the art. This was a nice way to close the series out. Cover Art - 5: I really like this cover. It has made me look over my shoulder while I have been working on the computer several times in the past few days. Because you never know if the Joker is going to be standing there with a giant mallet.